The CMCIG-sponsored program at the recent ALAO Conference in Toledo, “Wizards and Vampires and Nerdfighters, O My! Popular Literature in the Academic Library”, was a hit. Approximately 20 people attended. Nancy Down talked about the mission of the Browne Popular Culture Library, highlighting several collections in the library. Kathy Yoder talked about the “Crossover Fiction” available in the BGSU CRC, i.e. fiction that is popular with both teens and adults, that is common to both departments of BGSU Library. Co-chairs Amy and Stephanie plan to meet in the next month to plan the spring workshop — date and theme to be announced soon. Stay tuned for a Save the Date announcement! Honor of being named the 2012 Distance Learning Visionary. Recognition at the 2012 ALAO Annual Conference Luncheon, as well as on the ALAO Website, ALAO Newsletter, & the DLIG Blog. Reward of $150 presentation grant for sharing distance learning strategies, applications, or research with attendees of the 2012 DLIG Spring Workshop. Please note that the funds are contingent upon the grantee presenting in person, remotely, or via pre-recorded session. Nomination applications should include a 250-500 word essay that demonstrates the nominee’s contributions to e-learning, as well as a short presentation proposal that suggests what the nominee would share with colleagues striving to succeed in the technology-driven environment of online learning. Links to relevant supporting materials are encouraged; self and group nominations are permissible. For complete details and submission guidelines, please see the DLIG blog at http://distancelibrarians.wordpress.com, or email the DLIG Co-Chairs at ohiodlig@gmail.com. Applications are due by December 20th, 2011. 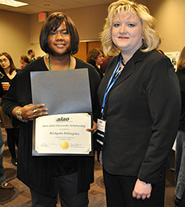 Bridgette Billingslea, recipient of the 2011-2012 ALAO Diversity Scholarship, was recognized during the awards ceremony at the ALAO Annual Conference on November 4, 2011. She was presented with a certificate by Diane Kolosionek, Diversity Committee Chair. As part of the scholarship award, Bridgette receives a year of mentoring by an ALAO member. Bridgette’s mentor is Sharon Purtee, Health Sciences Librarian at the Donald C. Harrison Health Sciences Library, University of Cincinnati. Sharon is a current member of the Diversity Committee. 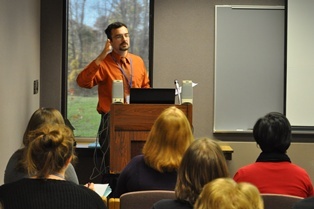 IIG sponsored a well-attended session (32 people) for instruction librarians at the ALAO Annual Conference on November 4, 2011. Otterbein University librarians Rares Piloiu, Judy Carey Nevin, and Lois Szudy presented Taking Tutorials to the Classroom: The Use of Tutorials in ‘Differentiated Instruction’. This was a timely presentation that included useful information on available softwares, challenges that arise when using tutorials, and benefits of video tutorials in library instruction. IIG also sponsored an information table at the Annual Conference. 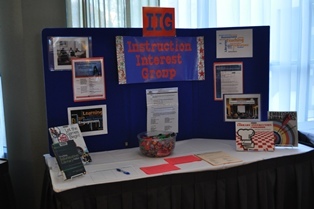 The table included a tri-board display, instruction-related books, teaching resources handout for participants, informational handout about IIG, and sign-up sheet for notification about the upcoming blog. We are thinking about our spring 2012 workshop and are eager to hear your ideas for a theme. Email Kathryn Venditti kvenditt@ashland.edu or Lauren Wahman lauren.wahman@uc.edu to let us know what workshop topics interest you or to suggest a presenter.